His approach is directed towards the development of a language that is accessible, dynamic, contrasted and resolutely contemporary. In a whirlwind of musical sounds and colours he created a fusion of jazz culture and classical culture through an approach based on rhythm and counterpoint. His catalogue includes music for orchestra (L’art du Thanatier, 2014, first performed by the Orchestre Symphonique de Bretagne; Material Songs for flute quartet and orchestra, commissioned by the French State in 2015), for chamber groups (Opus 23, music for a Gene for string quartet, 2014, commissioned by the Institut Suisse de Bioinformatique), vocal works (Un seul et même cœur for mixed chorus, 2015), jazz, music for films, documentaries and video games, teaching pieces and also musical tales (Les notes bleues, 2008; Caravane Gazelle, 2009; Zéphir, 2010). 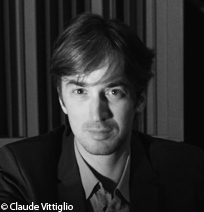 A composer of commitment, he has also composed for NGOs (non-governmental organisations) and humanitarian associations (Eau vive, symphony for wind band, 2009; Rite of Peace, symphony concertante for cello and orchestra, 2012, first performed by Xavier Phillips and the Coge [Chorus and Orchestra of the Grandes Écoles]).